Technical and vocational education and skill development / mechanical engineering in mechanical engineering from AICTE approved at least 60% marks in the mechanical full-time diploma or diploma, total or equivalent CGPA, through lateral admission in mechanical engineering. Electrical full-time diploma or diploma in electrical engineering, technical and vocational education and skill development in electrical engineering / at least 60% marks in total or equivalent CGPA from the institution approved by AICTE. Deputy Assistant Engineer (Civil) - Technical and Professional Education and Skills Development / At least 60% marks in the Probationer Full-time Diploma or Diploma total or equivalent CGPA through later entrance into Civil Engineering from the institution approved by AICTE. Deputy Assistant Engineer (Survey) - Probationary full-time diploma or diploma, through at least 60% marks in total or equivalent CGPA, through lateral admission in later engineering in survey engineering from the institute approved by technical or vocational education and skill development / AICTE. Junior Personal Assistant Graduate with 50% marks in total or Honors graduation in any subject from any University accredited by the UGC, which is proficient in English language. The candidates should know the operation of the MS Office with a minimum speed of 100 words per minute and computer key depression speed of 8000 hours per hour. Knowledge of typing in Bengali font is desirable. Office of the Executive Bachelor with a 50% marks in the total or Honors graduation in any subject with any other course on computer application from any registered institute in any subject accredited by the UGC recognized university. Regarding enrollment in any stream with the degree / diploma in general nursing and midwifery from any institute recognized by the State Nursing Council, with enrollment in the upper primary or equivalent and authorized nursing council. Assistant sub-inspector (security) pre-secondary (class XII board) qualification with the service of at least 5 (five) years in the regular army, navy or air force of the Union of India and BSF, CISF, ITBP , SSB only Experience of industrial security in any Central PSU will be given priority, State PSU will be given priority. Fitter 50% marks in secondary or any ITI / National Apprenticeship certificate (3 months BBBT) 06 months special module and 06 months advanced module] with Trade Certificate (2 years full time) / equivalent examination equivalent exam (3 years BBBT) years Duration) recognized by NCVT in fitter / electrician business. Under Assistant Teacher (Primary School) Higher Secondary Education, Higher Secondary (+2) pass, at least 50% marks or equivalent qualification (at least 50% marks) passed by any other statutory authority under the Higher Secondary Education Council has gone. Accredited Education Board / Council Bengali language should be read as either 1 cents or second language at the H.S level. All the candidates should have studied and obtained the Secondary Pass Certificate or equivalent issued by competent authority with mathematics and English. The 2 year Diploma in Primary Education (DL Ed.) [Any name known] is accredited by the National Council of Education (NCTE). With the knowledge of Draftman CDCM, 50% marks in medium or equivalent exam plus trade certificate (2 years full time) from any ITI recognized by NCVT. With the grade pay of Rs.40000 - Rs.400 with salary pay of Rs.2200200. Rs. 6000 with grade pay of Rs. 9 00 rupees - 20200 pay band. Band band of Rs.300 - 20200 with grade pay of 300 rupees. Rs 6000 with grade pay of 2,600 Rs - 20200 pay band. Look around for "WBPDCL recruitment 2018" for operator / technician, office executive posts. 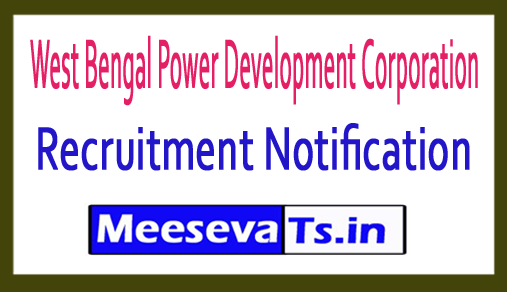 Recruiting WBPDC 2018: West Bengal Power Development Corporation has posted the official notification of the 47 vacancies of Assistant Manager and Welfare Officer. Qualified and trained candidates can submit the 2018 application form from West Bengal Power Development Corporation over the Internet. Mode from its official website wbpdcl.co.in. Interested candidates can apply online. for the WBPDC Assistant Manager & Welfare Officer Vacancy 2018 until the last date, which is September 9, 2018. Candidates may download the official notification from the official website before requesting this vacancy. For more information on the recruitment of West Bengal Power Development Corporation as eligibility requirements such as educational attainment, age limit, selection process, application fee and how to submit the application, important links, syllabus, tickets, results, previous documents are given below. Deputy Manager (Mechanics): Full time 4 years BE or B. Tech. Degree / Integrated M. Tech / Dual - Grade B. Tech - M. Tech. Program / B. Sc. - Technology B. / Technology B. through side entrance in mechanical engineering / power plant of a recognized university. Deputy Manager (Electrical): Full time 4 years BE or B. Tech. Degree / Integrated M. Tech / Dual Degree B. Tech - M. Tech. Program / B. Sc. - Technology B. / Technology B. by lateral access in electrical engineering from any recognized university. Assistant Manager (Instrumentation): Full time 4 years BE or B. Tech. Graduation / Integrated M. Tech / Dual - Degree B. Tech - M. Tech. Program / B. Sc. - Technology B. / Technology B. a through the side entrance in electronics and communication / instrumentation / control technology of a recognized university. Deputy Manager (Civil): Full time 4 years BE / B. Tech. / Integrated M. Tech. / Dual - B. Tech. Graduation - M. Tech. / B. Sc. - B. Technology / B. Technology through Sideline Program in Civil Engineering / Civil Engineering from a recognized university. Assistant Manager (HR & A): Completed in each discipline with at least 60% of the MBA (2 years full-time) / MHRM (2 years full-time) with specialization in Human Resource Management / IR / HR or Postgraduate / Diploma (2 years full-time) with a specialization in Human Resource Management / IR / HR from a university recognized by UGC. Assistant Manager (F & A): Qualified ACA / ACMA of the Institute of Chartered Accountants of India / Accountants of Costs of India. Assistant Manager (Corporate Communications): Awarded honors in English / Bengali with 60% qualification in honor of 2 years full time. Postgraduate Diploma / Diploma in Public Relations / Mass Communication from a recognized university / institute. Wellness Officer: 2 years full time postgraduate / diploma / MBA / MHRM with specialization in Human Resource Management / IR / HR from a university recognized by UGC. The selected candidates receive Rs.15600 - 39100 / - + Salary Pay Rs.5400 / - of the organization. The selection takes place after the written test / interview. Search for "WBPDC Recruitment 2018 for Assistant Manager & Welfare Officer". Start date of the application form: 17 August 2018. Date of completion of the presentation of the application: 9 September 2018.